Best Buy is having a limited time offer when you pick up any Nintendo Switch from them. 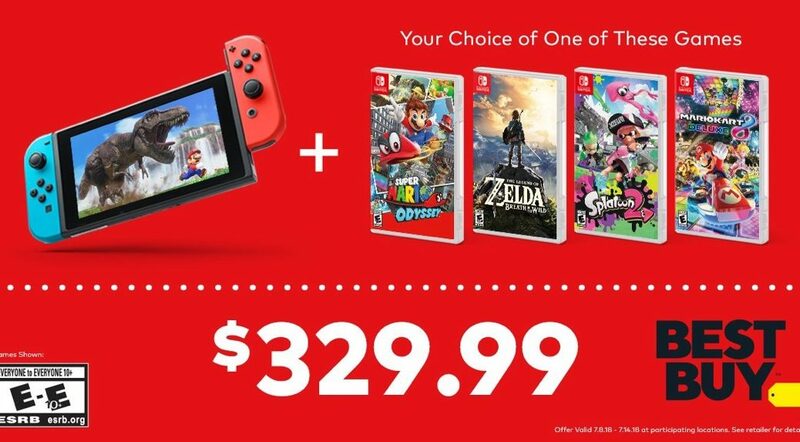 For just $329.99, you get to go home with one Switch console and a Switch game (choose from Super Mario Odyssey, The Legend of Zelda: Breath of the Wild, Splatoon 2, Mario Kart 8). That is around 50% off from the game. Offer only last till end of this week, 14 July 2018, you can get your bundle here. Save 50% on game with console. The Nintendo Switch lets you play at home or on the go. Dock your Switch and play on your television, or take it with you and play wherever you like. This week, when you buy a Nintendo Switch, you can save 50% on one of the hottest games for this console. Choose Super Mario Odyssey, Mario Kart 8 Deluxe, Splatoon 2 or The Legend of Zelda: Breath of the Wild and save.